get-away place. We both enjoy the relaxing quietness at the Blue Heron and Findley Lake. We are already looking forward to our next trip here. Thanks for another great weekend! - Cathy & Chuck W.
Please Call for Current Shopping Hours. Please call 716.769.7852 if you have a "shopping emergency"! We're happy to open outside of our published hours if available. Soon after purchasing what would become the Blue Heron Inn, the Ahlquist's decided to renovate the adjacent red barn into prime retail space. They rented the three 1st floor shops to a variety of enterprising shop owners and Tobi transformed the 2nd floor into a whimsical shopping experience she named “The Nostalgia Shoppe". The shop offers an eclectic mix of gifts for giving and gifts for keeping. Notable items range from nostalgic toys, games & candy for kids of all ages to artisan-crafted jewelry, leather & glass objects d’art; inspirational/new age items & much, much. In the winter of 2006 The Nostalgia Shoppe moved downstairs to the 1st floor of the barn, where it remains today. 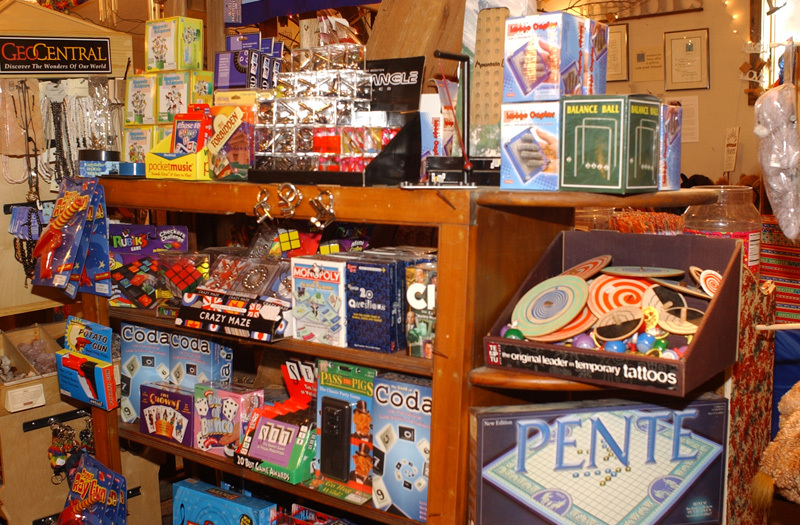 The toys and games, right out of the 1950's & 60's, include memorable, old-fashioned items that include metal jacks, marbles, balsa planes, tin toys & robots & more! 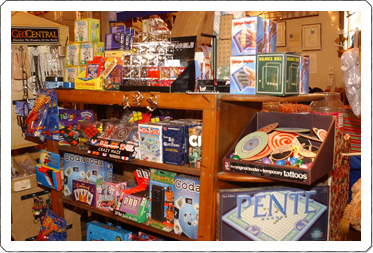 There are heirloom wooden toys, puzzles for young & old, playing cards, bridge accessories and an assortment of card games. The candy counter will bring back plenty of childhood memories; from wax lips, paper dots & sugar daddies, to nik-l-nips, flying saucer wafers, razzles & rock candy! Primal Elements® hand-crafted "soap by the slice" and Willow Tree® collectibles. Findley Lake tees, hoodies, ornaments, magnets and wine accessories round out the eclectic assortment of gifts. Nostalgia -- it’s the coolest store in town!